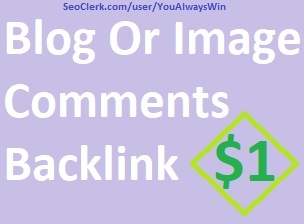 I will give you 12 Manual Blog Comments Backlinks High PA DA Sites and get rank higher in search engines.12 Manual Blog Comments Backlinks High PA DA Sites for $1 only. it's a great offer It’s Penguin and Panda Safe! Provide you working report in excel sheet, you can verify work. Currently, we accept only one URL, a short description with your Keywords for basic service. If you have more than one link then please buy multiple services or check extras. The basic order we complete in 3 days maximum. Using our service your website get high SEO rank. All niches allowed. Check my profile for other SEO services or check extras Follow my profile for future updateMark as ‘Add to favorites’ for future use this service order Now. 12 Manual Blog Comments Backlinks High PA DA Sites is ranked 5 out of 5. Based on 28 user reviews.